Router manufacturers typically provide periodic firmware updates for products covered under the terms of support. Checking for updates regularly will ensure that a router is functioning correctly, and avoid potential issues like intermittent wireless connections and other problems related to network connectivity. This article provides instructions on how to update the firmware of any router that is still supported by the manufacturer. Determine the router’s model and version number. Locate and write down the model and version numbers, typically located on the underside or backside of the router. The required information often is located near the manufacturer’s logo. Download the latest firmware update. Using your Internet browser, navigate to the manufacturer’s website. Navigate to the support or download section of the website and select your model from the list of products, or try entering the product information in the search field. Select the link for the latest firmware upgrade and click “OK” to save the file when prompted. The download will be completed in a few minutes or less. The firmware update has been downloaded and saved to the system’s hard drive. Locate the default gateway and IP address for your router on a PC running Windows. You will need to locate either the router’s default gateway or IP address, depending on the router’s manufacturer, in order to access the router’s web interface. From the start menu enter “cmd” into the search field. With the command screen open, type “ip/config/all. The default gateway and IP addresses will be located under the IP configuration information. Locate the default gateway and IP address for your router on a Mac running any version of Mac OS X. Click the Apple icon on the far left of the menu bar and select the system preferences option from the pull-down menu. Then select “Internet and Wireless” from the network menu. 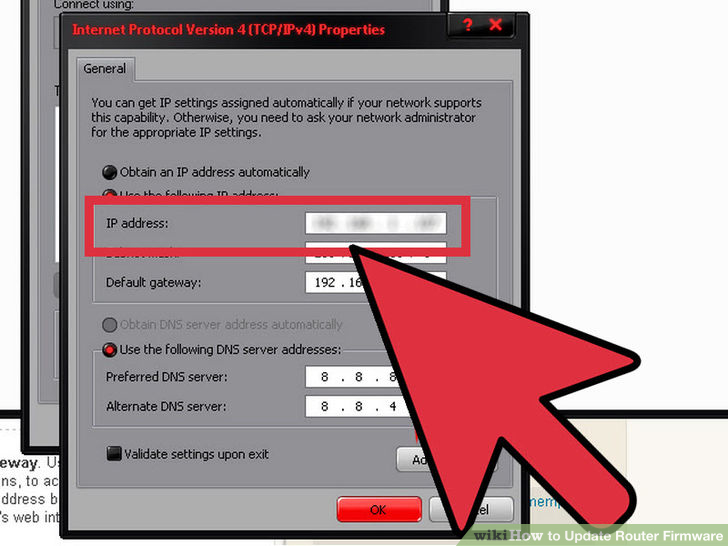 Click the “Advanced” button in the Network dialogue box and open the TCP/IP tab. The default gateway address will be listed under “Network.” Write down the gate default gateway and IP address information, and exit the dialogue box. Type “ip/config/all” with the command screen open. The default gateway and IP address will be listed among the IP configuration information. Access your router’s web interface using the default gateway. Use the default gateway number or IP address, depending on your router’s specifications, to access the web interface for your router. Type the default gateway or IP address into the address bar of your Internet browser. Press enter if you are not immediately directed to your router’s web interface. The web interface will appear in your web browser window. Update the router firmware from the web interface. Locate the firmware upgrade option, typically listed under “Administration” as update or upgrade firmware. Once located, a dialogue box will prompt you to select the file from a location on your hard drive. Click the “Browse” button and locate the firmware update file you just downloaded. Once you have located the file, click upgrade or update firmware and wait for the firmware update process to complete. The router’s firmware has been updated to the latest version.